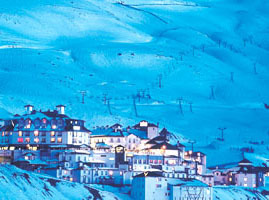 The Sierra Nevada ski resort is located at Pradollano, 2,100m high in the Sierra Nevada mountains. This is the most southerly ski resort in Europe and it is quite small in comparison to other European resorts and is less well-known outside of Spain than many of the resorts in France and Italy. However, the facilities are considered top rate and it has, therefore, hosted numerous national and international ski events. Natural snow is supplemented by snow cannons on some runs, and many skiers are pleasantly surprised to find that, because of its southerly position, the air temperature is usually warmer than other resorts. 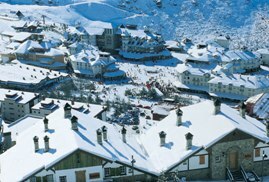 The fact that it is less well-known is actually a plus, since it is not as busy – except at weekends and during Spanish holidays when locals come to ski – and the UK February half-term is excellent value for money as it is not considered high season in terms of prices and will generally be fairly quiet. An important factor that very few resorts are able to boast, is that you are practically guaranteed sunshine throughout your stay! Being so far south, the climate is superb for brushing up on the deepesk ski tan you are likely to get anywhere. Visitors are consistently stunned at how the snow lasts during the typically deep blue skied, sun-blazoned days. The ski resort caters very well for families with children's facilities such as the recently developed Mirlo Blanco recreation zone with activities including Ski Bike, Inner Tubing, Ice Skating and the new "Roller-Sled". The creche and Snow Garden are well-run establishments with fully-trained staff to look after children up to seven years old. 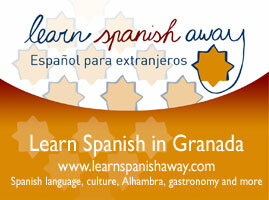 See our properties in Granada with easy access to the Sierra Nevada ski resort. The Sierra Nevada ski resort has numerous runs of varying difficulties to satisfy all levels of skiers. One of the special features of this resort is the wide pistes and the range of runs from very easy to very difficult, so it presents a challenge for skilled skiers and snowboarders as well as being perfect for beginners. Ski and snowboarding lessons are available through a reputable ski school in the resort and are good value for money, and all equipment can be hired from the numerous shops in the resorts. There are also many off-slope activities, including a children’s area and a thriving resort village with numerous restaurants and bars. Depending on the snow levels, the season generally runs from the end of November or the beginning of December until sometime in April. The slopes do close at times due to high winds or bad weather, however Granada is the perfect location in that there is so much else you can do if you aren’t able to ski, and by staying outside the resort itself you are well placed to make the most of the other attractions that the area has to often such as the city of Granada and the Alhambra Palace. 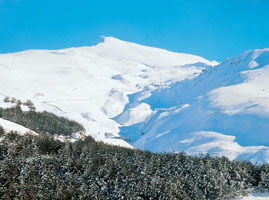 The Sierra Nevada ski station is easily accessible from both Granada and Malaga provinces. From Granada, it is 45 minutes by car or bus just south-east of Granada city (follow signs for Sierra Nevada, the road is good, although there are lots of curves as you approach the ski station). From the coast or the Alpujarras and Valle de Lecrín, take the A-44 motorway towards Granada, taking the turn off for Ronda Sur, also signposted Sierra Nevada. It is often said of Granada that you can ski in the morning and be on the beach in the afternoon – and it is true! The ski station is less than 2 hours from the Costa Tropical and the mild climate of the coast means that the beach is inviting even in winter. You may not want to swim in the sea or strip down to a bikini, but it is certainly pleasant to enjoy the sun and the warmer temperatures than those you find in Granada itself at that time of year. Read more about the Costa Tropical and its beaches here. Get a feel for being on the slopes in the Sierra Nevada (please note this is a video that has been posted on You Tube; we have not made it, nor do we know the people who have, but we just feel that it gives you an idea of what the skiing is like).